It's nearly impossible to get rid of every trace of algae in your aquarium, but it is possible to control it well enough that it's no longer visible or having any impact on the health of your fish. Algae needs light to grow, and the more light that is available the faster it will grow. Keep the tank out of direct sunlight, moving it to another location or room if necessary. Also, limit the amount of artificial light by turning the tank lamp off whenever possible. If there are live plants that rely on the light, leave it on only as much as necessary to keep the plants healthy and turn it off at night. Certain fish and aquatic animals feast on the algae in your aquarium. The amount each of these can consume is limited, and it's important to consider the biological load they add in balance with the amount of algae they can remove, but some of these tank creatures are worth their keep. 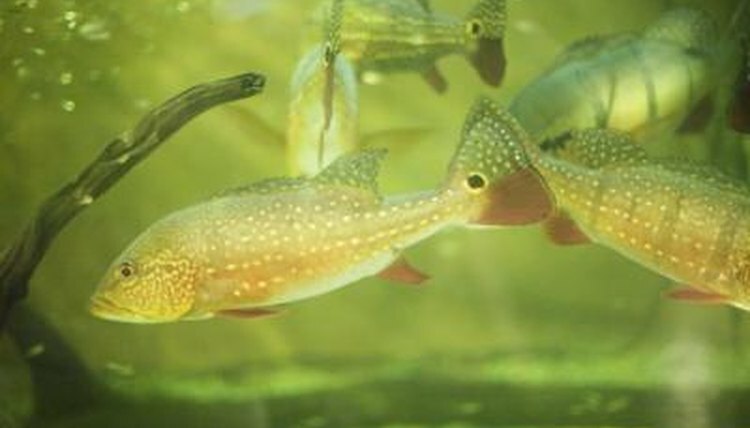 Otocinclus and bristlenose catfish, Siamese and Chinese algae eaters, and plecostomus are all efficient at removing algae. Grazing snails can also keep algae under control. Commercial chemicals can be used to remove algae, but it's important to know that they can also be harmful to certain fish and live plants. It's generally safer for your tank to use a combination of cleaning, aeration and natural controls to limit algae. Use chemicals sparingly and only when absolutely necessary, such as in the case of a severe algae bloom that cannot be brought under control with other methods.